Rachael Ray has become famous for providing quick and easy meals for busy families on her television show. Back in 2008, she branched out and wanted to provide a balanced nutritional line of cat foods. Now, she has two major products that help give your kitty a happy, healthy life. As a bonus, the company donates a percentage of its proceeds to the Rachael Ray Foundation, which helps pets in need. Whether your cat is an indoor-only companion or prefers the wild outdoors, there is a Rachael Ray food for them. 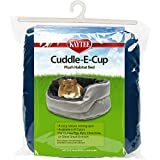 Indoor cats have different food requirements than outdoor cats, which makes this Rachael Ray Nutrish Indoor Complete Natural Dry Cat Food a top choice. It’s formulated with chicken, salmon, and lentils, too. Chicken and Chicken Meal - These are the first two ingredients, which is excellent for a dry cat food. You want high quality ingredients listed first, rather than fillers. High Fiber - Two sources of excellent fiber, including pumpkin and dandelion greens, keep your kitty’s digestive tract running smoothly. Right on the bag, it says that no ingredients have been sourced from China, so you are getting high-quality American made with this Rachael Ray Indoor Complete Dry Cat Food. 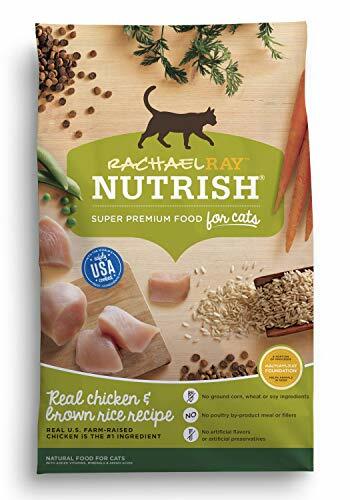 Real chicken and brown rice combine for a protein- and carbohydrate-rich balanced meal for your kitty in this Rachael Ray Nutrish Natural Dry Cat Food. 34% Protein - Cats are predominantly meat eaters, so you want a food that gives them as high a protein percentage as possible. Moisture - Many cats suffer from urinary tract problems brought on by food that’s too dry, so having a lot of moisture is a good thing! Yeast is listed as an ingredient, which is not beneficial for cats. It upsets the healthy gut flora in the intestine and can produce digestive problems when portions of the food are unable to pass properly. A small kibble size, plenty of real chicken, and no poultry by-product meal are all benefits to feeding your kitty this Rachael Ray Nutrish Natural Dry Cat Food. Wild cats catch and eat fish as a huge part of their diets, so feeding fish to your domestic cat is an all-natural choice perfect for their digestive systems. This Rachael Ray Nutrish Natural Dry Cat Food comes in multiple flavors, too. Salmon - Salmon is one of the best fish to feed your kitty, since it’s so high in Omega 3 fatty acids that help with heart and brain functions. Prebiotics - This Rachael Ray food also contains beet pulp, a natural source of prebiotics to help feline digestion. It also helps reduce stomach and intestinal disorders. Like the chicken and brown rice version of this same cat food, it also contains corn gluten meal. Cats aren’t meant to eat gluten in any form! Salmon is not just good for humans; it’s good for cats, too! All those same nutritional benefits found in this Rachael Ray Nutrish Salmon and Brown Rice recipe is excellent for cats. 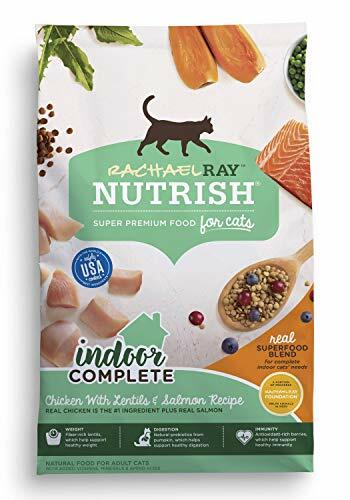 Support your kitty’s naturally carnivorous preferences by feeding them this yummy Rachael Ray Nutrish Natural Dry Cat Food. You can buy it in three sizes – three pounds, six pounds, or fourteen pounds. It also comes in two cat-pleasing flavors, either chicken and brown rice or salmon and brown rice. Real Salmon and Chicken - When reading the backs of pet food bags and their ingredient lists, the first one listed is the most nutritious. Both of these Rachael Ray Nutrish cat food varieties have a real protein source listed as the first ingredient. No By-Product Meal or Fillers - Dry cat foods can have harmful ingredients as fillers that give your cat all kinds of digestion issues like bloat, hairballs, or constipation. Yet, this food doesn’t contain any fillers. This Rachael Ray cat food is nutritious, but it also contains brewer’s yeast. Cats are carnivores and don’t have the digestive tract of an animal who could correctly process gluten. Rachael Ray’s Nutrish line of adult dry cat foods is easy to find and really popular, since it is an excellent source of proteins, vitamins, and minerals for your kitty. Rachael Ray’s dry cat food product line isn’t as comprehensive as other brands, but it’s gained a devoted following for being nutritious, complete, and popular with even picky feline eaters. The Indoor Complete has prebiotics to help with every aspect of your cat’s digestion. The Nutrish Natural formulas have brown rice for long-lasting good carbohydrate energy. Any of these dry cat foods would be excellent for your kitty companion!